To draw this track line, the project identifies existing privately owned public spaces (POPS) and subway stations as commercial opportunities bounded by a newly proposed river-to-river, auto-free light rail line loop intersecting with 42nd Street in Manhattan, NYC. Literally ‘reverse redlining’ an exclusionary zone where headquarters of multinational corporations will flock to, the Daily Grind becomes an iconic low-tax SEZ and business improvement district. The project, a transit-driven capital development, seeks to critique the daily grind of commuters through a series of overlapping moments in-between seemingly un-commercialized altruistic interventions and hyper-commercialized spaces. 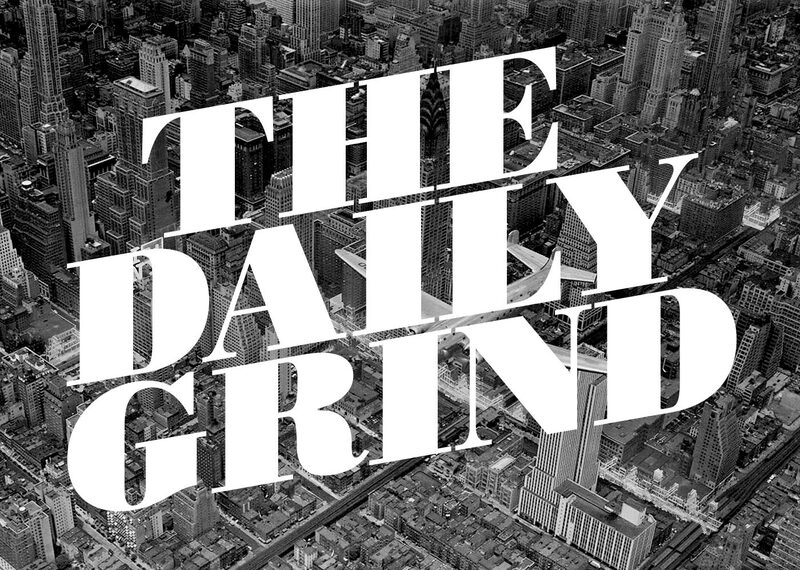 Recognizing the erosion of public spaces in neoliberal cities, initiatives such as POPS and their parasitic relationships are to be interrogated in the Daily Grind project. This hyper-commodified privately owned mobility infrastructure project deploys conspiracy as a form of critique, a deceitful narration of ‘legitimate’ practices that critique the anxious relationship between public space and the rituals of the daily grind. The project accentuates the monotonous everyday commute through heightened commodifications that instigate exclusionary practices modulated through varying degrees of access. As real estate agents once used to say ‘buy land, they’re not making it anymore,’ the project exploits the limited but desired land of Manhattan, NYC. Commodifying territory through the establishment of a lucrative special economic zone, the proposed loop demarcates an exclusionary zone within the city. Spatializing exclusionary policy, the project instrumentalizes mobility infrastructure by commodifying a circular tram line into a neoliberal system. Following the market’s demand, new scaffolding stations are constantly being constructed while being deconstructed. The perpetual logic of a kit-of-parts deployment assembles the market-desired stations along the line, housing multi-national corporates currently fleeing the country. Capitalizing on the everyday commute as practice in its monotonous mundane parts of being caught in slow traffic, the project proposes a kit-of-parts to be deployed along a newly proposed river-to-river light rail loop. Essentially commodifying the commute into the loop, parts to be potentially deployed range from more banal daily activities such as Coffee Shops and ATMs to lifetime activities such as a Drive-thru Wedding Chapel or a Funeral Parlor. Through the act of viewing and constructing individual mental images, an experience is being commodified within the scaffolding intervention. Accentuating the everyday, the repetitive daily grind is amplified by the individual’s experience of the commute itself, both producing and consuming the constant spectacle.